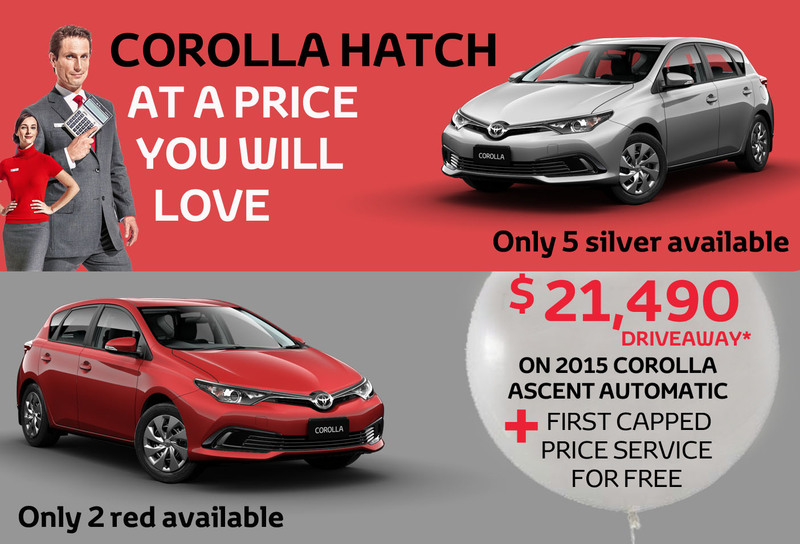 Benefit from Torque Toyota’s exclusive April clearance drive away price on the 2015 Corolla Ascent Hatch automatic in silver and red. This red hot deal will end on April 30th and will only be valid while stock lasts. We currently have 5 silver Corolla available and only 2 in the red option. Save up to $4,068 on a new Corolla by the end of the month and only pay $21,490 Drive away. In addition, we will also offer you your first TSA (Toyota Service Advantage) Capped price service for free as part of this exclusive deal. Driveaway price of $21,490 includes 12 months of registration, 12 months compulsory third party insurance, dealer delivery and stamp duty. Vehicle must be purchased and delivered before 30/04/2016. Offer only valid at Torque Toyota North Lakes and Strathpine. Servicing up to the value of TSA nominated value for your vehicle. Offer does not include up-sells, tyres, repairs or work which falls outside a standard vehicle service. This free offer TSA service is only applicable to eligible vehicles in this instance 2015 Corolla Ascent Hatch Silver Pearl or Wildfire. TSA service can only be redeemed at Torque Toyota North Lakes or Strathpine. TSA is governed by separate terms and conditions.